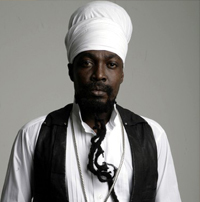 Junior Reid is a Jamaican reggae/dance hall artist that is best known for the song "One Blood" as well as being the man that replaced Michael Rose as lead vocalist in the legendery reggae group Black Uhuru. His vocals has been also used in the hip hop scene which first debut as a sample in the "One Blood Under W" track from the The W album by the Wu-Tang Clan, which was released in November 21, 2000. In The Last Years Junior Reid has collaborated with different hip - hop stars going to the top of the charts like with West Coast hip hop rapper The Game on the song "It's Okay (One Blood)", The song samples Junior Reid's 1990's single "One Blood". Junior Reid got his initial inspiration from a tough upbringing in West Kingston's Waterhouse district, notorious for being one of the most dangerous places in Jamaica. It was there in the politically turbulent mid-'70's that he recorded his first-ever single "Know Myself" at the age of 14 for the late Hugh Mundell, released in the U.K. by Greensleeves. He then went on to form his own band, the Voice of Progress, and after a local hit with "Mini-Bus Driver" the group scored local success with an album of the same name. He was then commissioned by the great Sugar Minott to record a number of tunes on Minott's Youth Promotion Label, enjoying considerable popularity with tracks such as "Human Nature," "A1 Lover," and the evergreen "See How Me Black See How Me Shine," an uplifting and proud statement which became an anthem to the ghetto youth whom Junior increasingly championed. Junior Reid moved on transferring his talents to King Jammy's studio on St. Lucia Road where his fast-growing success rose yet another notch. "Boom Shacka Lacka" was his first UK hit and led to another exceptional album. After a number of fine singles - which included "Youthman," "Bank Clerk," "Sufferation," "Give Thanks and Praises" and "Higgler Move" - his chance of a wider audience came with the offer of replacing Michael Rose in Black Uhuru. Always a strong follower of Black Uhuru, and with a similar vocal style, Junior slipped into Rose's shoes with ease and the collaboration on his first Uhuru-period album "Brutal" was well received by all. Two years and two albums later Junior's interest to produce material for himself drove him back into the solo arena and back to King Jammy's Studio where he recorded and released this title in the early '90s. Reid also contributed his production to Snow's sophomore album, Murder Love, released in 1995. Recently Reid appeared on Mims' "This Is Why I'm Hot Remix" from his debut album M.I.M.S. (Music Is My Savior).